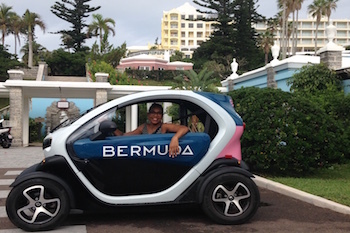 Traverse Bermuda in a Twizy, a snazzy 2-seat electric vehicle. Horseshoe Beach offers pink sand and a natural pool. 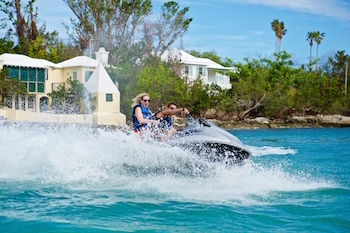 Jet skiing is a fun way to see Bermuda. Pedal the Railway Trail and see the sights at your own pace. The British isle of Bermuda may be known for its traditional ways, yet there are beautiful pink sand beaches, fitness jaunts, eco-adventures, local culinary treats and a notorious geometric shape to explore. Here are 20 popular and historical family-oriented sightseeing opportunities, listed alphabetically, that locals on the island have recommended. 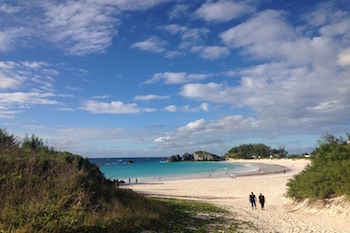 Bermuda and beaches go together like Fred Astaire and Ginger Rogers. The turquoise ocean is fringed by unusual pink sand, so building sand castles takes on a whole new hue. The variety of beaches is impressive. If you’re traveling with young children, don’t overlook iconic Horseshoe Bay Beach. On its western fringe is Baby Beach. This natural pool is surrounded by large rocks that form a protected environment of shallow, calm water, perfect for tiny travelers. More than 100 species of fish from the dazzling to the deadly can be found at the Bermuda Aquarium, Natural History Museum and Zoo. A self-guided, informational audio tour moves with you along tanks filled with native species including angel fish and friendly turtles, Moray eels and menacing barracudas. Learn about Bermuda’s early history as an island culture, the beginnings of the whaling industry and the details of early undersea exploration. Be sure to visit the primate enclosure, reptile walkway, aviary, and the invertebrate house, a recent addition with a “please touch” tank. You also might see its resident peacock wandering the grounds. Internationally recognized as a center for the preservation of threatened and endangered species, the complex is situated in Flatts Village. More of a nautical legend than a tourist attraction, this wedge shaped swath of the Atlantic Ocean bordered by Bermuda, Puerto Rico, and Fort Lauderdale, Florida has been a site of ominous menace for navigators supposedly since the times of Columbus. The American legends of the region began in earnest on December 5, 1945 when the infamous Navy Flight 19 disappeared after suffering compass troubles while flying over the mysterious triangle. Five Navy Avenger bombers and one rescue plane were lost without a trace, a total of six aircraft and 27 men. The Bermuda Triangle did not receive its official name until 1964, and since its naming many have been able to attribute the mysterious disappearances to rational explanations. Others however, attach a mysterious and evil power to the watery region, also called “The Devil’s Triangle,” and speculate that its sinister power could be growing in scope each day. If your family is concerned about protecting aquatic resources, don’t miss a visit to the Bermuda Underwater Exploration Institute Ocean Discovery Centre in Hamilton. It offers interactive exhibits that dive into the importance of a healthy marine environment. Check out one of the world’s largest shell collections, learn why Bermuda is the shipwreck capital of the world and explore the history of the America’s Cup, the prestigious sailing race that came to Bermuda in 2017. It’s a wonderful place to spend a rainy afternoon. The Reef Explorer is a double-decker glass-bottomed boat. Passengers may view underwater sights, including sea turtles, coral reefs and the remains of an 18th century shipwreck, from the comfort of the boat. If your family wants to get active, consider the 3-hour cruise to a secluded cove with snorkel gear provided. Bermuda’s wealth of casual dining options should tantalize young appetites. To get a bona fide feel for the island’s distinct culinary traditions, rise and shine and indulge in a traditional Sunday breakfast. This fortifying morning meal consists of a healthy portion of codfish cake served with bacon and potatoes plus sides including avocado, banana, boiled egg and Bermuda onions. You’ll get a delectable Sunday breakfast at the Specialty Inn. Service is friendly and the casual atsmosphere is inviting. The BUEI Blue Train at the Bermuda Underwater Exploration Institute is a fun way to chug around the island. Board the train at the Hamilton Ferry Terminal or Ocean Discovery Centre and sit back as guides point out the sites of Hamilton, this country’s capital. There’a robust network of efficent, pink-tinged public buses (known as the Bermuda Breeze Bus) that will get you all around the island. Four public ferry routes are a scenic way to get where you want to go. Bermuda’s isolated Atlantic Ocean location, far from any other landmass, helps to explain the bounty of fresh fish that graces local tables. Seafood lovers will be in a heaven of briny bites. Codfish especially has a venerable history on the island. Salted dried codfish was brought to Bermuda centuries ago as an inexpensive and nutritious way to feed Bermudian slaves. It remains a beloved ingredient. Some of the most impressive concentrations of limestone caves in the world are to be found along the Harrington Sound Road. Crystal Caves and Fantasy Caves are sure to awe young spelunkers with their tranquil beauty. The gaping caverns of delicate stalactites and stalagmites have inspired creative artists from Shakespeare to Jim Henson, who staged the Muppets’ “Fraggle Rock” series in a similar underground world. Probably the most exciting kid adventure is Dolphin Quest, where kids and adults alike can have a one-on-one swim and play time with a dolphin. One of the island’s few concessions to changing times, Dolphin Quest provides educational encounters with gentle dolphins for ages 3 through adult. Advance reservations are definitely required. Get a bird’s eye view of the island when you climb 185 steps to the top of this cast iron lighthouse. Now fully automated, Gibbs Hill Lighthouse started shinning in 1846 making it one of the oldest cast iron lighthouses in the world. The staircase to the top is narrow and winding, so it’s not recommended for children under 6. The National Museum, located by the Royal Dockyards, has a wonderful new hands-on playground and playhouse. They really welcome families at the museum, with free admission for children under 16 years of age. Believe it or not, Bermuda used to have its own railway system because personal vehicles were banned from the island. Today, the 22-mile Bermuda Railway Trail (18 miles are publicly accesible) can be explored at your own leisure and pace. 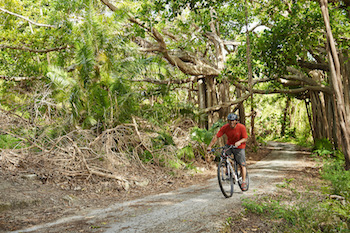 Bicycles, called pedal bikes in Bermuda, are a popular way for families to explore the trail. The trail touches all nine of Bermuda’s parishes, so it’s a fine way to get a comprehensive overview of the island. Kids can learn more about the island’s history, go exploring, or just have an excuse to run and play. Tourists are not permitted to rent cars in Bermuda. The Renault Twizy is a brand new way to traverse the island. It’s a snazzy two-seat electric vehicle that looks like a golf cart on steroids. Electric charging stations dot the island, located near top attractions, hotels and at several Airbnb rentals. Renting a Twizy (or two) might suit some families, just as long as the number of adult drivers equals the number of kids. The compact nature of the vehicle means you really can’t squeeze an extra kid in. If it makes numerical sense for your family, it’s a fun way to see the island. The Twizy may be rented at Current Vehicles located in the parking lot of the elegant Hamilton Princess hotel. Although the currently restored Dockyard is now a shopping and entertainment complex, the “Gibraltar of the West” once played a pivotal role in British plans to fortify Bermuda beginning in 1809. The Dockyard offers an excellent view of some of the grandest boats moored off the shore as well as crafts markets, hand-blown glass demonstrations, an arts center, restaurants, the Clocktower shopping mall, cinema, and the historic Commissioner’s House. Sailing is an important part of Bermuda’s history. Its low-lying reefs and wind make it a challenge to sail here, and that helps to explain why Bermuda recently hosted the ultra-prestigious America’s Cup and tops the seasoned sailor’s bucket list. Escape Charters’ 65-foot seafaring vessel offers half and full day charters. Snorkel gear and kayaks are included. Bermuda shorts, those quirky knee-length pants, are synonymous with the island. Locals wear them on all occasions, including formal dinners, to the office and to the beach. If you’d like to purchase a pair, head to The Authentic Bermuda Shorts flagship shop in Hamilton, locally known as TABS. They sell updated, hipster versions of this classic garment in sizes for adults and kids. Owner Rebecca Singleton uses a soft, comfortable cotton fabric and a bold palette of colors, with cutting edge prints designed by local artists. Taxi sightseeing tours are a relaxing and convenient way to view the scenic splendor of Bermuda, and a guide can make the tour both entertaining and informative. Taxi drivers and tour guides displaying a Qualified Blue Flag Driver logo on their cabs are certified by the Bermuda Department of Tourism’s tour guide qualification program as knowledgeable of the cultural history, current events and resorts of the island. Rates may vary but are usually about $50/HR for one to four guests and $70/HR for five to seven guests. There is often a three-hour minimum. Qualified tour guides can be booked on request for tourists by hotel staff. More than 200 square miles of reef formations and an estimated 350 wrecks deep in the Atlantic make up a ceaselessly shifting, living underwater gallery. Several charter boat tours offer daily schedules of cruises designed for swimming, fishing, snorkeling, sightseeing, watersports, and just plain relaxing. For adventures on the water, H2O Sports offers the chance to sail, kayak, fish and much more. Their guided jet ski tour is fun and informative. You need to be 16 years of age to operate a jet ski, but kids of all ages may ride with an adult. For additonal information to help plan your trip, visit GotoBermuda.com. Images courtesy of the author and Bermuda Tourism Authority.